FDA Guidelines For Developmental and Reproductive Toxicology (DART) Studies for Small Molecules. Author-Writer: Stephen J. Williams, Ph.D. This posting is a follow-up on the Report on the Fall Mid-Atlantic Society of Toxicology Meeting “Reproductive Toxicology of Biologics: Challenges and Considerations post and gives a brief synopsis of the current state of FDA regulatory guidelines with respect to DART studies on small molecule (non-biological based) therapeutics. The following is adapted from the book Principles and Methods of Toxicology by Dr. A Wallace Hayes (1) and is an excellent reference on reproductive toxicology and testing methods. Chemical insult occurs to the human reproductive system at a multitude of stages in development and the life cycle, leading to the extensive testing which must be performed to diligently the reproductive and development toxicity of a chemical/drug. Abnormalities and toxic manifestations in the offspring may result from insult to the adult reproductive (either female or male) and neuroendocrine systems, as well as damage to the embryo resulting in embryolethality, fetus at any period during organogenesis, juvenile development or, in the case of certain antibody therapies, immune system development. The latter, toxic insult to the developing immune system could possibly be manifested as either an immune defect in the newborn or, later in life, as tolerance to said therapy. It is estimated that exposure to the pregnant woman, of either environmental contaminants or drug, is significant. It is estimated that a mother may be taking an average of 8-9 different drug preparations, mostly over the counter preparations such as antacids, vitamin preparations, cathartics etc. with the maximal drug intake occurring between 24 and 36 weeks of gestation. 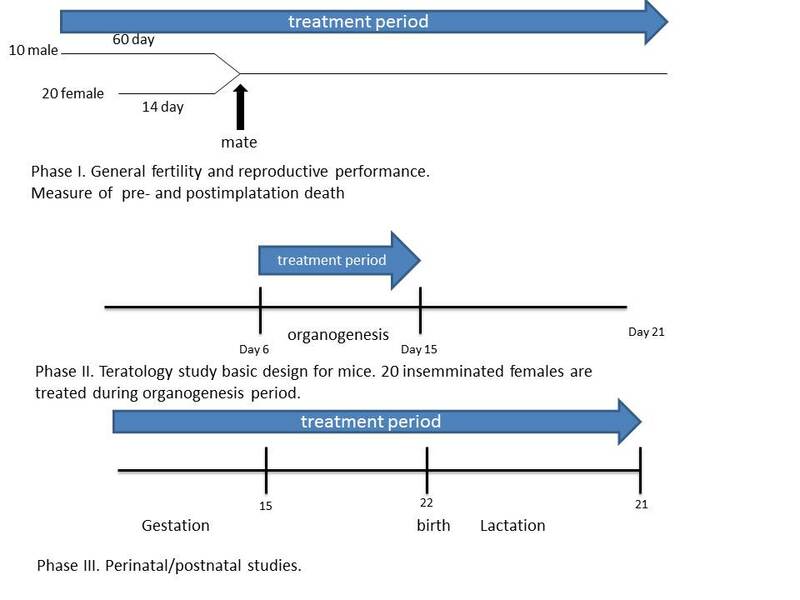 The following table shows the dependency of developmental stage to teratogenicity: adapted from J. Manson, H. Zenick, and R.D. Costlow from Principles and Methods of Toxicology. It is not generally accepted that there is a dose dependency of teratogenesis however most teratogens have specific mechanisms of action and teratogenic effects occur at much lower doses than result in maternal toxicity. However, the developmental toxicity may be manifested later in life, including as reproductive toxicity affecting adult fertility and familial generations. FDA requires one control group and two treatment groups, and evaluation of at least two species. However, most studies will use two rodent and one nonrodent species. Multigenerational DART studies are conducted for compounds likely to concentrate in the body following long-term exposure. Examples of types of compounds include pesticides and food additives. Figure 1. General Design of a Multigenerational DART study. Weanlings (30-30 days of age) from the parental generation are treated for a period up to 60 days. At 100-120 days of parental generation, animals are mated. Fx = filialx . III. Phase III: peri- and postnatal evaluations. I will read and comment later on. It is a very important for us to have an ongoing effort on FDA Guidelines on pharmaco-therapy, drug classes, and specific diseases requiring safety protocols.